Don’t forget about the visuals! This week’s Marketing Monday tip is a reminder that a picture says a thousand words. Adding videos and images to your Web site, Facebook account, blog, etc. can increase your views and keep people coming back. Some of our most viewed posts at the Chamber include YouTube videos and photos from our events. You don’t have to be a professional to add video or images, in fact you don’t even have to take them yourself. 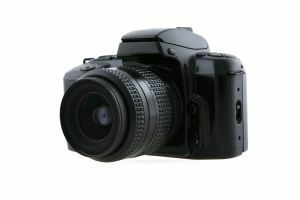 Most cameras have a video feature that allows you to record short clips, or link already existing YouTube videos to your site. If you’re not interested in taking your own photos check out creative commons sites such as Flickr. Photos on this site are free to use as long as you provide photo credits. 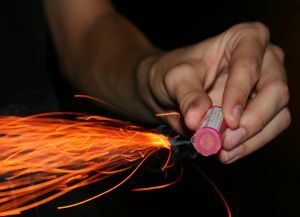 Looking for some fireworks this Fourth of July weekend? Siouxland’s sky will be filled with color this Friday and Saturday at multiple events offering fireworks shows. A fireworks show will follow the Big Parade starting at dusk. The parade is free and runs down 4th street ending at the Sioux City Convention Center. The parade begins at 7:00 p.m. The Sioux City Explorers take on the St. Paul Saints in a home game starting at 7:05 p.m. Fireworks will begin after the game. The X’s take on the St. Paul Saints for a second night at home, Lewis and Clark Park. The game starts at 7:05 p.m. with a fireworks show following. 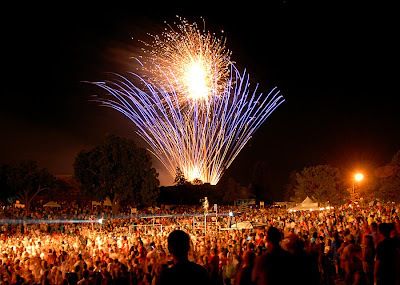 A fireworks show will follow the Counting Crows, this years headliner, at Saturday in the Park. 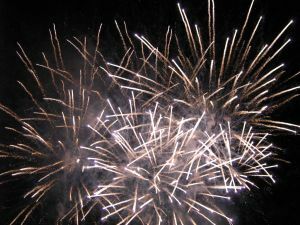 Fireworks usually begin around 10:30 p.m.
Congratulations to this week’s winner Gary Anderson. Everyone that answered correctly was entered in a drawing for this weeks prize, 4 tickets to Friday’s on the Promenade! Be sure to check back tomorrow for the next Chamber Trivia Question. Because we are coming up on a busy holiday weekend , I thought I would post just some of the many things going on in the area. Anyone who says there is “nothing to do” in the Sioux City Metro Area should check out just some of the things going on in Siouxland..they might be surprised to find out what many of us already know. We live in a vibrant and happenin’ community. Mardi Gras party at the Sioux City Convention Center featuring astounding costumes – some 14 feet high -and a processional. The “Taste of Louisiana” authentic Cajun food prepared fresh by Louisiana chefs and available beginning at 5:00pm, prior to the 7:30pm show. FREE general admission seating; reserved table seating available by calling 712-279-4850. FREE Mardi Gras parade in Sioux City running down Fourth Street, and ending at the Sioux City Convention Center beginning at 7:00 pm with beads, bands, floats, and bouncey inflateables for kids for only $5.00 admission.Live entertainment following the Parade, and fireworks at dusk. FREE annual 4th of July weekend music festival with kids area, concessions and more. Shuttle service from Tyson Events Center parking lot.Over 20 food vendors and multiple craft vendors will be in Arts Alley, plus fun for kids in the Kid’s Zone. Here at the Chamber, we have been tweeting at Twitter for several months. We’ll be the first ones to admit that just about the time we start understanding what it all means, another rule, symbol or trend emerges. Now, not only is it important to learn Twitter, but the many applications that go along side this social media phenomenon. One of the comments that I hear most often is from businesses is “Why should MY company or business use Twitter, I don’t care who is [going to school to pick up the kids].” It’s true, there are many situations where Twitter can be a huge waste of time and not relevant to use during the workday. However, there are also a lot of very useful ways for businesses to take advantage of this free and viral marketing tool. RT # @ ?!? What does it all mean? Mashable (a social media site) has put together the Twitter Guide Book. The guide offers resources for beginners to experts and covers topics such as managing your Twitter stream to promoting your business. Starting with the 17th Annual Chamber Golf Classic Monday, this week has been full of green coats, ribbon cuttings, and signs of growth in Siouxland. 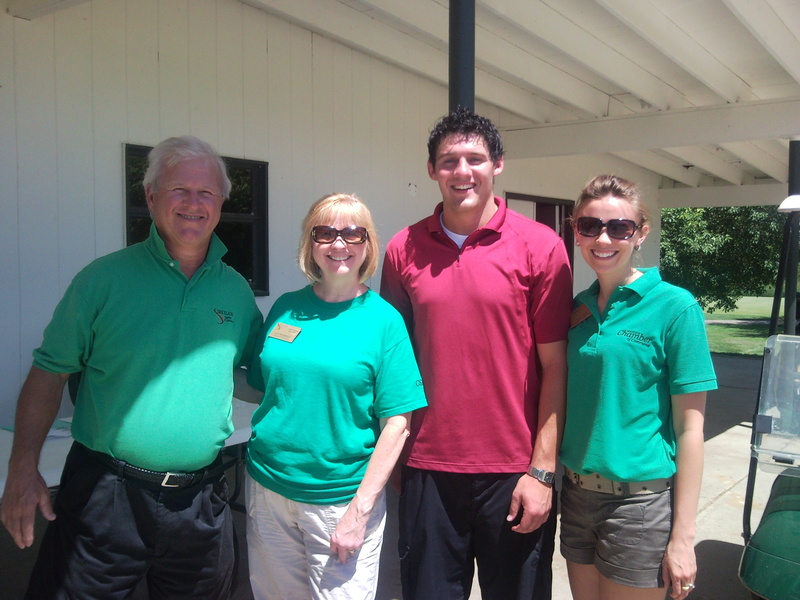 17th Annual Chamber Golf Classic: Monday the Chamber Golf Classic kicked off at Whispering Creek and Two Rivers. It was a hot one, but teams enjoyed a day outside the office full of networking, great golf, and a delicious banquet ending the day at Bev’s on the River. Perkins Downtown Ribbon Cutting: Tuesday a ribbon cutting was held for the downtown Perkins Family Restaurant complete with new management and great remodel. Bakery goods were handed out to those in attendance. Girls Inc. Grand Opening: Wednesday a grand opening celebration was held for the new building and location (500 main street) of the Girls Inc. facilities. A cookout was held and tours were given to donors of the project. Ramada Ribbon Cutting and Open House: Thursday Ramada hosted a ribbon cutting and open house to celebrate their remodel. Delicious food and drinks were served at this evening gathering. Scrapbook Your Life Ribbon Cutting: Friday Scrapbook Your Life hosted a ribbon cutting for their recent move to Southern Hills Mall. This scrapbooker’s store features products unique to Sioux City including local schools, River-Cade, Saturday in the Park, and Awesome Biker Nights. Last week the question was asked: What Indianapolis based firm highlighted the Siouxland Chamber of Commerce blog as being one of the top five nationwide on its Web site? Congratulations to this week’s winner Judie Campbell. Everyone that answered correctly was entered in a drawing for this weeks prize, 2 tickets to Friday’s on the Promenade! Be sure to check back tomorrow for the next Chamber Trivia Question. This week’s update is from the Chamber’s Chris McGowan. Don’t miss weekly updates from the Chamber every Wednesday. Social Media Intern, Zach Andersen, came out of retirement to help Director of Investor Relations, Beth Trejo, and Chamber Ambassadors at the Golf Classic this past Monday.